An adventurous cat named Sam explores her neighborhood at night in this gorgeously illustrated book. Informational, beautiful, and deeply moving, Mapping Sam is both a book about how maps work and an engaging, character-driven story. For fans of Brandon Wenzel's They All Saw a Cat and Sara Fanelli's My Map Book, and for anyone who wants to know what is where and how to get from here to there! Maps can show us streets and subways and cities and countries. But they can also show us what we can't see, what we can only imagine, or how to build something. 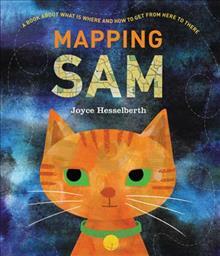 In Joyce Hesselberth's Mapping Sam, Sam the cat puts her family to bed, and then-when all is quiet-heads out to explore her neighborhood. As Sam follows her customary path, wandering farther and farther away from home, readers encounter different kinds of maps illuminating different points of view and the various spots Sam visits. Finally, when Sam reaches her favorite place and confirms that all is well, she heads back home, climbs onto a cozy bed, and falls asleep. An ideal read-aloud for classrooms and libraries, Mapping Sam features a page of background information, as well as various maps and map terms throughout. Perfect for fans of Lynne Rae Perkins's Frank and Lucky Get Schooled and Peter H. Reynolds's The Dot.